Filmmaking is a collaborative, artistic process involving people with egos and opinions. Just about everyone involved has ownership of some percentage of the final product and, especially if they are not getting paid or are getting paid very little, they are hugely invested in that final product being great or what’s the point for them being involved? This can be a recipe for disaster in the pre- and post-production world. When you’re on set and in production the collaboration is face-to-face and the roles are defined and visible so it is easier to manage and to detect when something is heading in the wrong direction. In the pre- and post-production world where people communicate much more by email the potential for being misunderstood and for conflicts blowing out of proportion is so much greater. Often times the way we communicate is by asking for ‘notes’ or being given them whether we want them or not from people higher up the food chain. There are two times we usually ask for and get notes: in script development and in the editing process. Getting notes, considering them and implementing them can make your film project better. It can also be frustrating, infuriating, it can make you very defensive and, if you blindly try to incorporate every note you’re given, it can make your film worse not better. Be gracious when you are given notes especially if you asked for them. Again, this is especially true in the low/no budget filmmaking world. If you ask someone you respect to give you notes they are taking time out of their life to do this as a favor so don’t get dismissive or defensive with them if they say something you don’t agree with or like. Don’t ask for notes for something you don’t actually want criticism on. If what you really want is a compliment, a pat on the back and an ‘at-ta-boy’ then send it to your mom. If you ask for criticism you will get it. Don’t waste your reviewer’s time asking for notes you have no intention of even considering because you think the piece is already finished. Take care who you ask notes from. If you’re not the top of the food chain there are some people who you will have to take notes from. Beyond that only ask notes from people whose opinion you respect. When you ask for notes you are asking for criticism and you will usually get it. If you respect the person giving you notes you are much more likely to take their notes more seriously than the notes you’re getting from some faceless executive. Consider the note givers position, experience and point of view. The notes you get from someone experienced in the process will be very different from the notes you get from someone who has never made a video in their life, however, both can add value. The more experienced filmmaker may see things you are not experienced enough to have noticed. The novice’s opinion may be much more in line with your target audience and so just as useful. Be respectful of the opinion of those whom you have to ask notes from even if you’re doing it as a formality. Perhaps some backer wants a producer credit and wants to be involved in the process. Dismiss the money man at your peril. They are not just a source of cash; their ownership is just as valid as yours and you’re probably going to want them to back a bigger project in the future. Involve these people. Genuinely consider their notes. Thank them for being involved. Show them why their note might not work. Take the time to cut the section two ways if you have to and really show them why your way works. It behoves you to try to gently educate these people as you go especially if you may be working with them again. Be specific about what you want notes about and the specific deadline you want them back by. Give people a reasonable but finite time to get back to you. Also, if there are areas you are specifically concerned with tell your note givers so that they can give you notes in that area. You’re not entitled to notes from someone so ask politely and don’t make demands. This is especially true if you are asking for notes from someone who is not invested in the project but whose opinion you respect. Try to be as objective as you can; try to leave your ego out of it. This is easier said than done when the project is your baby and you have so much time invested in it. Just remember that notes are not criticism. If some note makes your blood boil take a breath, an hour, a day or a week before crafting a response - never reply in anger. Once your emotions have settled you may find something of value in these notes that you can still use. Follow-up on every note. When you send out your next cut let people know what notes you have incorporated. If you haven’t incorporated a note into the cut explain to the note giver why. Always let a note giver know that they have been heard and that you’re not ignoring them. If they feel ignored they can damage your project. Pick your battles - know when to fold and when to dig in. When someone higher up the food chain than you gives you comments you must address them. If you don’t agree with them know when to fight for what you want and when it is ok to give the reviewer their point. If you fight every note it will only serve to polarize your two positions over everything in the project. If you offer a criticism be sure that it is specific and that you offer a solution to address the problem you see. Here’s a note I received once “I’m not inspired but that might be because of the annoying music.” How do I address this? The music where? One person’s annoying makes another’s top ten list: of course I’ll be on the defensive if chose or even wrote the music. What do you want me to change it to? I don’t want to waste my time switching out the soundtrack over and over until I stumble on something this note giver likes. Instead give me some guide as how to fix the issue. Imagine the knee-jerk reaction I had to this note and how I had no idea how to address it. Now imagine how much more likely I would be to be able and willing to address your issue if it was phrased like this: “I don’t think the background music fits the chase scene. Can you find something a bit less Techno and a little more Jan Hammer? Don’t use loaded or emotional language. For example, ‘annoying’, ‘hate’, ‘stupid’ will evoke strong reactions and put the filmmakers on the defensive rather than the collaborative. Be concise and specific. Don’t use a full paragraph if a few words will do. It’s a waste of your time and the filmmaker’s. Notes are so much more digestible if you can come up with a couple of positive things to say before you go on to list a whole load of things you see as issues. As the old saying goes, you catch more flies with honey than with vinegar. Even if you think what you just saw or read needs a lot of work it is rarely difficult to find something nice to say. If everything you say is negative your filmmaker will be on the defensive and will find it hard to consider anything you said or your opinion in the future. It’s also worth ending on a positive note too. Filmmaking is all about collaboration and the relationships you make will often continue long after this one project is finished. Don’t make notes on things that cannot be addressed at this point. If you’re asked to make notes on the edit and this is the first time you’ve seen the project and you hate the script you can’t tell the filmmaker that he has to rewrite or recast the whole thing. He might not even be able to film any pickup shots at this point so try to work with what is there. 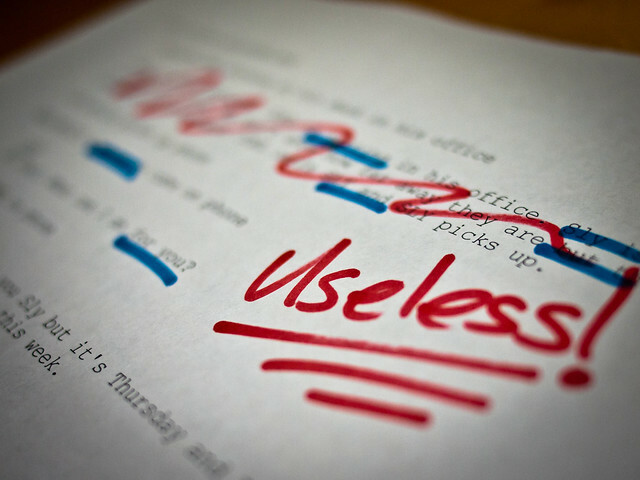 Suggest edits to mitigate those elements you strongly dislike. Be polite. Don’t be condescending. Give notes you would want to receive. Be quick in getting notes back. If you can’t get notes back to the filmmaker inside the deadline or you don’t have time at all it takes less than a minute to send an email explaining why you won’t be able to deliver within the time frame or at all. If you think the person or project is beyond help don’t burn bridges. Be polite, don’t waste your time and just bow out of the project. It’s a small world. You will meet this person again and you may have to work with them. If you tear this project to shreds that’s what they will remember about you. Read through or watch the subject once before you make any notes at all. After that first pass write down your general first impressions of the whole work. Also describe and plot or character issues you have that are confusing you. When you go through after the first time you comments can be more granular. Make comments about individual scenes and then page by page or minute by minute. The tips you have just provided will be very helpful to those people who wanted to try filmmaking. This definitely includes myself because, honestly I wanted to try making my very own film. Thank you so much for this! How I wish everyone would read your tips! I can sense "constructive criticism" in your article. If I would give ideas, I'd be happy to read "change this part" instead of a big "useless!" I would be motivated to try again for the better if my boss would approach us properly. But I guess it's really the problem in the filmmaking industry; you have to be tough in taking these criticisms. Film making is really hard because of the involvement of people with egos and opinions. I learned a lot from you and I agree on everything that you’ve said.